"Notifier for Google™ Calendar" makes it easy to keep track of life's important events all in one place. The extension provides a toolbar button and a panel view to track registered events on Calendar. You can customize the badge to display events of the defined period of time. Please note that this is not an official product of Google and its sole purpose is to provide an easier way to access this service. How can I refresh the badge text? As of version 0.1.6, you can open the panel and select refresh button to request the refresh of the badge counter. What is the meaning of the badge text? Badge text counts the total number of active events you have on your calendar for a custom time period (default is 24 hours). To review the events just hover your mouse over the toolbar button. 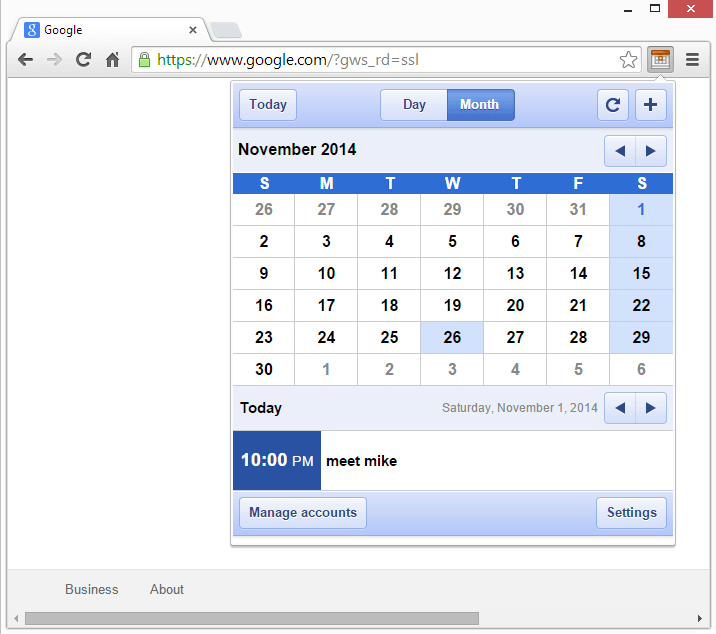 For more through view, click on the toolbar button to open Google Calendar inside the panel. Do I need to keep being logged-in in order for Google™ Calendar to display updates? How can I remove my iCal url from the extension? Simply open the options page and clear the iCal URL box. In Chrome, if I am not logged in to my account, the panel is blank. Is there any workaround? How does Google™ Calendar extension access my calendar info? Toolbar badge does not display any events although I have a few events. Any workaround? Make sure you are logged-in into your account. If you are logged-in and you can see your events in the panel, but still badge does not display the correct count, please report this in the comments section of this page. How to add or remove the toolbar button in Firefox? How can I access to the extension's settings?